Ages and ages ago – about two weeks since next Thursday – a giant green dragon stole my baby brother, Godfrey. Well, okay, the giant green dragon actually stole the house. Godfrey, who is only almost three, was inside watching TV. I saw it all happen. An actual eyewitness. From two houses down and across the street. At thirty-two-and-a-half minutes past three o’clock. Exactly. Gran was minding Godfrey while Mum fetched me – Georgia – and my other brother, Henry, from school. Gran wasn’t in the house when it was stolen though. Georgia returns home from school one afternoon to witness her house being stolen by a big green dragon. No one else saw it though and she has a struggle to convince them that she knows what has happened. Dad keeps trying to convince the family to look on the bright side, but Mum in particular is finding it difficult to see any positives in losing her baby – and their house. Georgia sees clues everywhere but no one will listen to her. It becomes clear to her that she’s going to have to make plans of her own if her house and her baby brother are to be reunited with the rest of the family. Black and white illustrations begin each chapter and are scattered throughout. 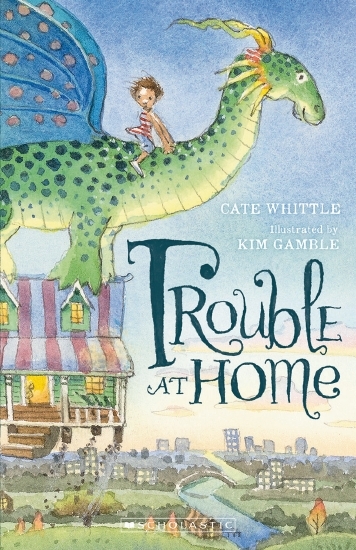 Trouble at Home is the first in a new series of stories from Cate Whittle with illustrations by the late Kim Gamble, with three forthcoming instalments listed in the final pages. At first it’s not apparent whether the dragon is a figment of Georgia’s imagination, but as her investigations progress, it’s evident that this dragon does exist. There are parallels with Anna and Barbara Fienberg’s ‘Tashi’ series, not only because they share an illustrator. There is plenty of deadpan humour as the family dynamics and adventures are reflected through Georgia’s first person perspective. Ideal for the newly-independent reader, chapters are short and there is plenty to giggle at.